Sign up for our Brewsletter to receive information on special events, bottle releases, deals & more! Once again our friends at Allagash Brewing Company are flying out fresh lobsters and supplying us with rare beers for what will be a full day of food and fun. We'll be serving up lobster specials all day long and pouring these rare Allagash brews: Avance, Emile, Jospehine, Cuvee d'Industrial, Mattina Rossa, Windfall, Curieux, White, Hoppy Table Beer & St. Klippenstein. This is an all day event with free entry, no tickets needed. Lobster specials and rare beers available for purchase while supplies last. We're opening Urban Roots Brewing & Smokehouse in Downtown Sacramento! The proverbial cat is out of the bag - WE'RE OPENING A BREWERY! You may have already read in the Sacramento Bee, but our fearless leader, Rob Archie, is partnering with brewing legend Peter Hoey to start Urban Roots Brewing & Smokehouse. This new project has been in the works since 2011, when Rob and Peter first dreamt of opening a brewery. With their combined experience in the brewing and restaurant worlds, Urban Roots hopes to be a welcome addition to the already vibrant Sacramento craft beer community. Rob, Peter, and the entire Pangaea Crew want to extend a big thank you to all of our loyal fans and customers. We could not have made it nearly nine years—or embarked on this exciting new endeavor—without all of your love and support. Since we opened in 2008 to when we first had beer on draft in 2009 (shout out to St. Bernardus ABT 12 and Blanche de Bruxelles for still holding it down to this day), the wonderful people of the Oak Park and Curtis Park neighborhoods, as well as everyone throughout Sacramento, have given us the drive to deliver our best. Looking ahead, we hope to continue to provide the same experience through good food, good beer and good company both at Urban Roots and here at Pangaea Bier Cafe. The Urban Roots family cannot wait to bring you the best in beer and food as soon as possible. Watch this space for continuous updates on how things are coming along in the brewhouse and kitchen. Also follow us on Urban Roots social media. While you wait, we're throwing a little party here at Pangaea in the coming weeks to celebrate the launch of Urban Roots. Some of you may remember Hoeybier, Peter's phenomenal saison collaboration with Sante Adairius out of Capitola. This beautiful beverage was brewed as an homage to Peter's storied Saison when he was the co-owner and brewer of Odonata Beer Company. Well, batch two of this delicious brew is just about ready, and we've been allocated a keg and some bottles. Pangaea will be the only place that this beer will be available outside of the brewery in Capitola. So come down, grab a couple bottles to go and toast to the past, present and future of Pangaea Bier Cafe and Urban Roots Brewing & Smokehouse. We'll announce the official date once we get word from Sante that the beer is all packaged, kegged up and ready to enjoy. Thank you to everyone who joined us on Friday night to kick off Sacramento Beer Week at our Beer Dinner with Connor and Tim from Cellarmaker. We had a great time listening to stories from Connor and Tim and enjoying all of the delicious beers they brought with them. 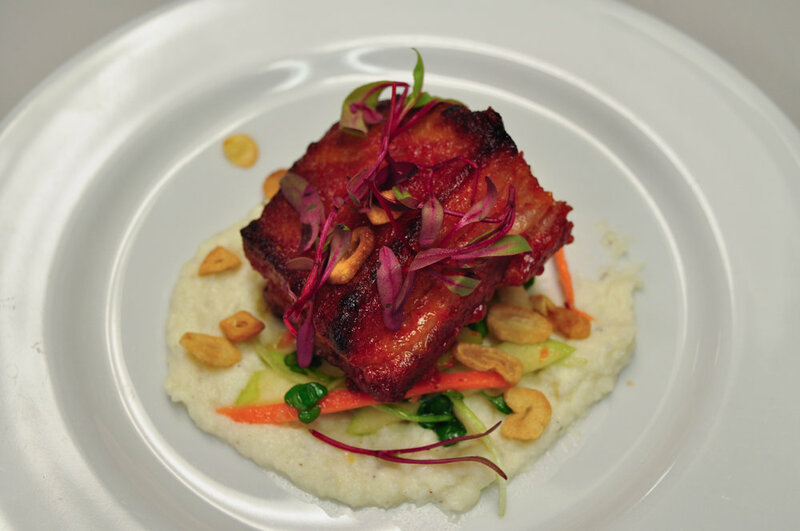 Chef Brett and Greg put together a killer menu including a Chili Glazed Pork Belly that was to die for. If you haven't experienced a Pangaea Beer Dinner yet then you should certainly add it to your to-do list! We will have some great beer dinners coming up in the next few months, sign up for the Brewsletter at the bottom of this page to be the first to find out about what's coming up next. We kicked off the new year with a very special pop-up dinner hosted by the one and only, Chef Greg Desmangles. This was Greg's first pop-up dinner and he created a six-course dinner that was unforgettable. The dinner sold out and we had a packed house which made this night even more fun. The first course was a charcuterie board unlike any I've ever seen before; it was loaded with Hog Head cheese, cajun mortadella, pickled shrimp, pimento cheese, assorted pickled vegetables, deviled eggs and Tennessee hot chicken skin and pork rinds. It was paired it with a Blackberry Lemonade Spritzer that balanced out everything perfectly. Course number two was the Rockfish Po'Boy paired with Jolly Pumpkin Bam Di Castagna. This was one of the highlights of the night and it was clear at this point that we were in for four more courses of killer dishes. Just when I thought things couldn't get much better, out comes course number three, Ramen. Now we've all had Ramen before, but this wasn't your ordinary Ramen, you could taste the love that was put into this. Greg spent hours hand making noodles which were cooked perfectly and paired with a smoked hock ham broth, egg, smoked pork AND brisket, plus pickles. I washed this down with a glass of Allagash Dubbel and prepared myself for the next course. This dish was by far the crowd favorite of the night. Course number four was Fried Chicken and Waffles. A confit duck fat chicken wing, a crispy cornmeal waffle with a spiced honey bourbon syrup paired with Firestone Walker's Pivo Pils. The fifth course was Greg's famous Gumbo which makes an appearance on our specials board from time-to-time and it was delicious as always. Last, but not least, course number six, dessert. A spiced yam doughnut with bourbon caramel and bacon, plus a sweet tea creme brûlée. I was lucky enough to try both of these desserts earlier in the week when he was prepping for the dinner and I had looked forward to them ever since. Thank you to everyone that joined us and made our first event of the year, and Greg's first pop-up dinner such a success. If you missed out on this, you will have an opportunity to experience it soon! We will be hosting a beer dinner during Beer Week in March with Cellarmaker that is sure to be a good time. More information will be sent out in the Brewsletter, so sign up at the bottom of this page if you want to know about it first!